or a long time the Ursern valley was an important starting point for the crossing of the Alps. 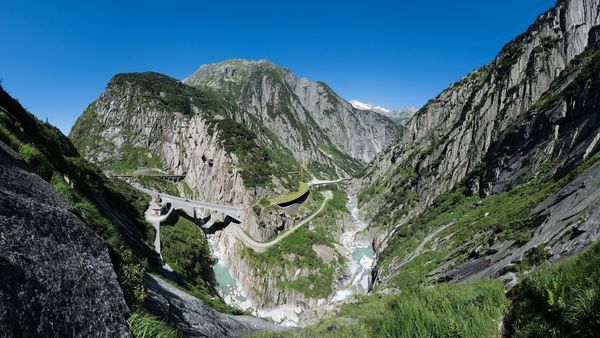 It connected northern Europe and southern Europe via the Gotthard, the west via the Furka and the east via the Oberalp Pass. 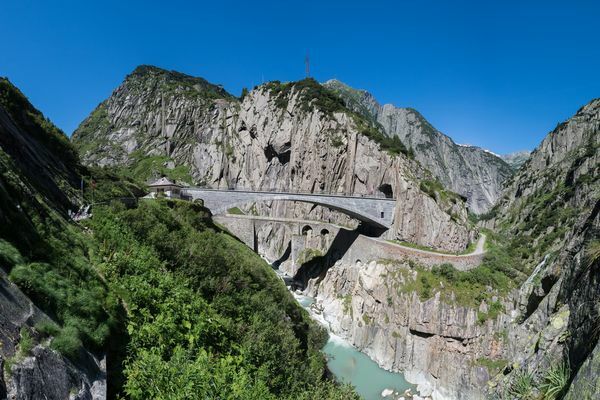 The importance of the region was demonstrated above all by the fact that the Gotthard is the only Alpine crossing where travellers only have to cross one pass. This advantage was of great importance in all epochs. 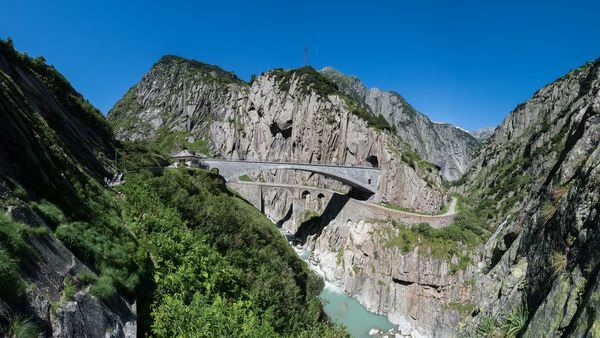 As early as 1200, the Schöllenen Gorge, which is difficult to walk through, was opened up with two wooden bridges, the Twärren Bridge and the Devil's Bridge. The technical skills most probably came from the Walser people. Finally, the Schöllenen Gorge no longer had to be laboriously bypassed. The first stone bridge was built around 1585. The first documents with the name Teufelsbrücke (Teiffels Brucken) date from this time. 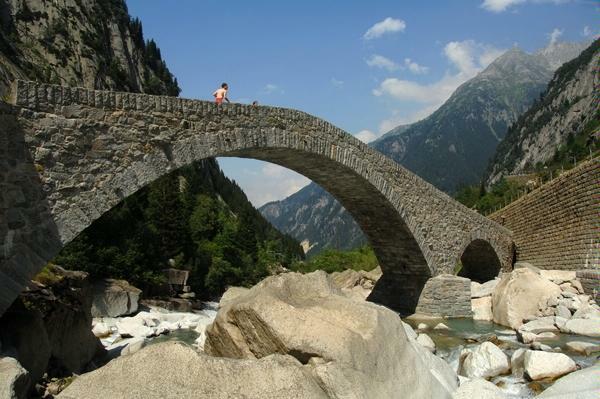 The first stone bridge lasted just 60 years. A big storm in 1640 destroyed the bridge and flooded the whole valley. Until the damage was repaired, the gorge had to be laboriously bypassed again over the Bäzberg or through the Riental via Gütsch. These repair costs were refinanced by increasing customs duties within a few years. Nevertheless, it was clear that the infrastructure of the Schöllenen had to be improved and made safer. In 1707 the first project to bypass the Kirchenbergfels and thus the Twärren bridge was presented. Pietro Morettini, an experienced fortress builder from the Maggia Valley, dared to break through the rock and took over the tunnel construction. He managed this in only eleven months and is considered today to be the builder of the first alpine tunnel ever. The original dimensions of the tunnel (Urnerloch) were 2.1 m in width, 2.4 m in height and approx. 60 m in length. Morettini was so mistaken about the costs that he was bankrupt after the completion of the tunnel. However, the people of Urschen and Uri recognized the unbelievable benefits of the tunnel and decided to increase customs duties again. Because with the improved connection many more goods and persons could be transported. In addition, the local goods, such as the famous "Ursener Käs" or the crystals of the valley, were now traded throughout Europe. By increasing the customs duties, Morettini was also made debt-free and he even received a bonus. The whole infrastructure suffered again and again from the intensive transit and trade traffic. 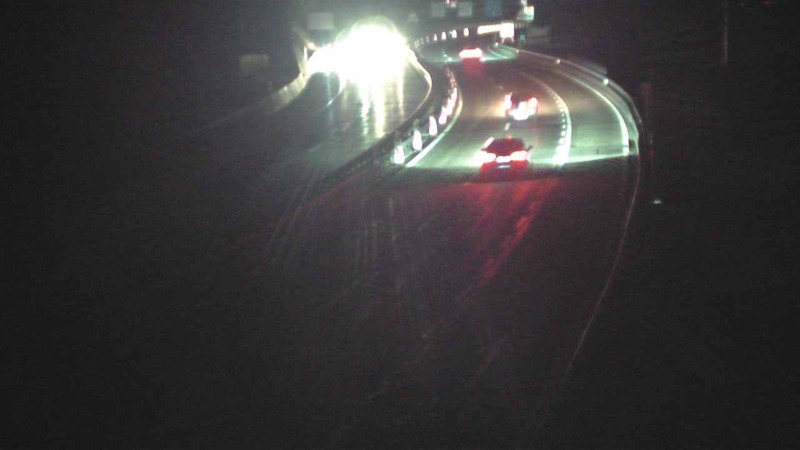 Bridges and roads were badly affected by the forces of nature and the warlike actions around the Gotthard even threatened to interrupt the entire pass connection. Economic interests in the south as well as in the north of the Gotthard formed the basis for the investments to finally make the Gotthard connection drivable. After a few delays, the expansion was carried out in two stages between 1818 and 1826 and 1826 and 1830. Now the Säumerweg had become a road for carriages and sledges. But this era did not last long either. The 15-kilometer Gotthard railway tunnel from Göschenen to Airolo opened as early as 1882. This tunnel was a pioneering achievement and was considered the longest tunnel in the world until 1905. At the same time, it meant the end of the stagecoach and the busy pass traffic over the Gotthard. After a long tradition of hemming the Gotthard, the journey over the Gotthard finally shortened from several days to several hours in around 100 years. During the heyday of the Säumer, a journey from Lucerne to the Italian border took a good 5 to 7 days. The same distance could be covered in 24 hours with the introduction of the stagecoach. The opening of the railway line shortened the journey again to about 9 hours. This shows the fast change which the population had to adapt again and again. Because of the dependence of the transit traffic they were always at the pulse of the change and had to adapt again and again to the new economic needs. 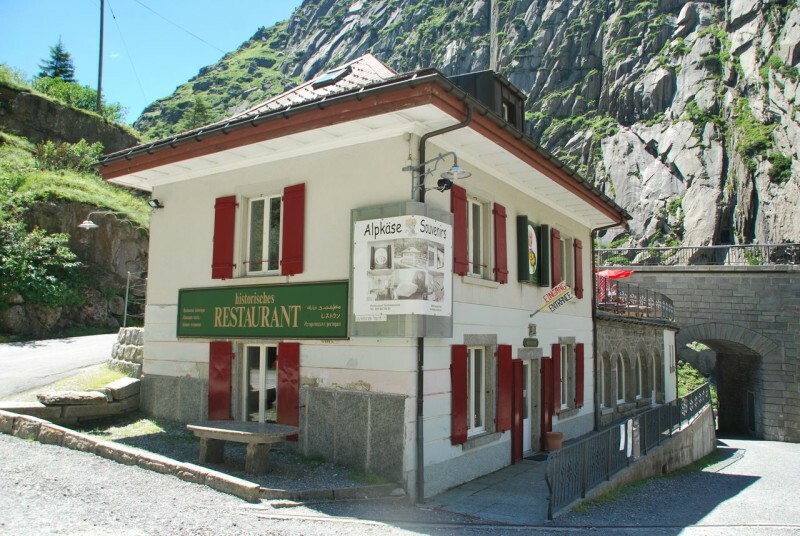 The narrow rock bar above Göschenen has always blocked access to the Gotthard and thus to the transition to the south. It therefore proved to be extremely difficult to build a bridge there. 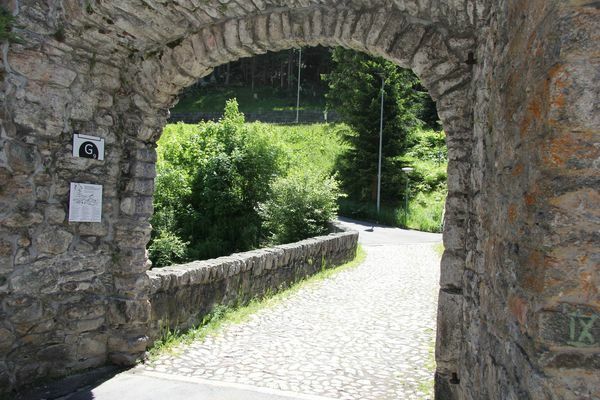 The legend, which tells of the futile efforts of the people of Uri to build a mule track through the narrow Schöllenen gorge and a stone bridge at the point where the young Reuss pushes through vertical rock walls, shows how difficult the situation was. In his despair, the landammann shouted: "The devil shall build a bridge! Then he appeared and said, "I will build you a bridge. But the first one to go over it shall be mine." The people of Uri agreed to trade. After three days a bridge actually arched over the Reuss. On the other side the devil sat and waited for his reward. Instead of a human, however, the people of Uri sent a billy goat over. "You may keep it," they shouted, "here you have the first soul that crosses the bridge! Full of anger the devil tore the billy goat apart and got a huge stone to destroy the bridge again. Then an old mother of the way came, recognized him and carved a cross into the stone. 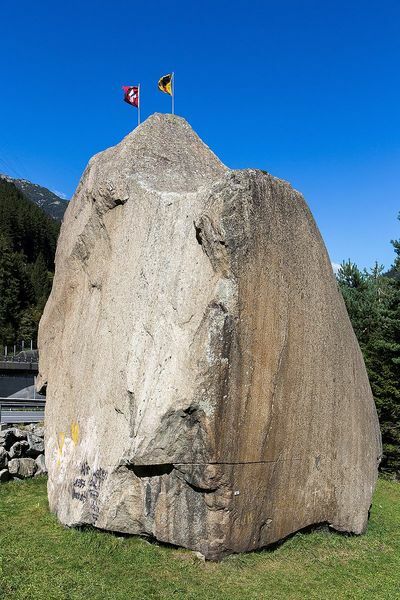 When the devil saw this, he missed his target and the stone landed in the valley, not far from Göschenen. It has been lying there ever since. For the construction of the motorway the "Teufelsstein", as it is called, was simply moved to a new location. 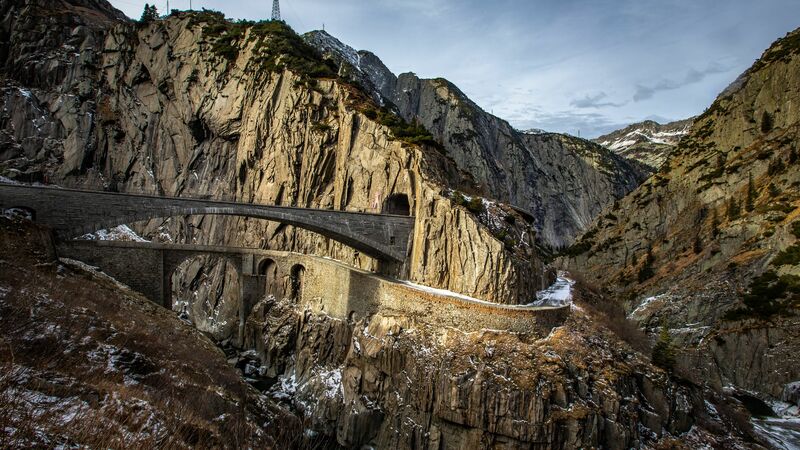 The large monument at the Devilsbridge in the Schöllenen Gorge below Andermatt cannot be overlooked. It is dedicated to the Russian general Alexander Suvorow. 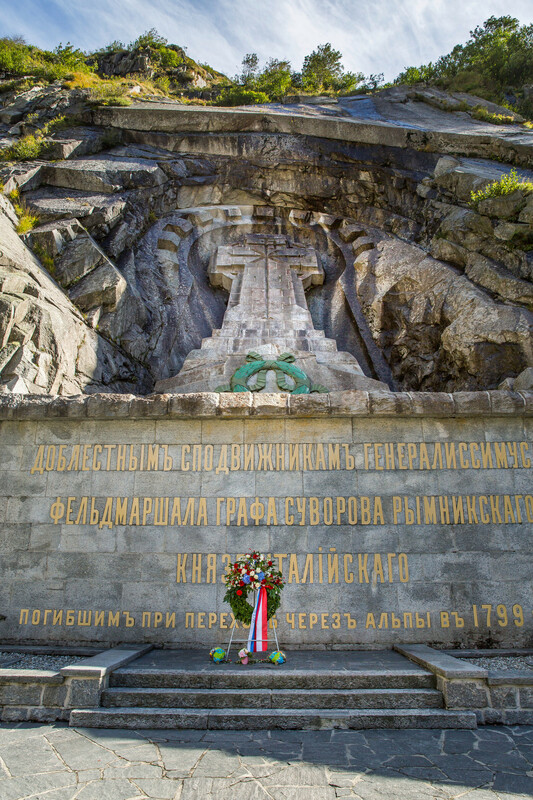 The Suvorov monument commemorates the fighting that took place in the Schöllenen Gorge on 25 September 1799. Russian troops under General Alexander Vasilyevich Suvorov fought against Napoleon's soldiers and finally defeated the French. On September 15, 1799, Suvorov reached Monte Ceneri with 21,000 men and defeated the French at the Gotthard Hospice on September 24, 1799. Then the French filled the Urnerloch with rubble and blew up the Devil's Bridge. One day later Suworow had wooden beams brought in, tied them together with the officers' sashes, thus erecting an emergency bridge and forcing the passage at great loss. The monument was erected in 1899 by Russia in honour of Suvorov and the fallen soldiers. Russian President Dmitry Medvedev visited it on the occasion of his Swiss state visit on 22 September 2009. 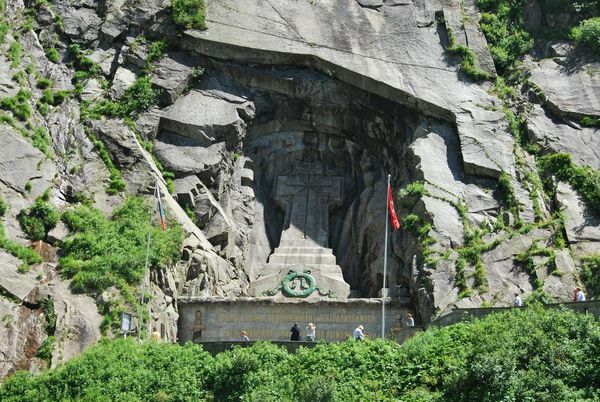 From Andermatt you hike to the legendary Teufelsbrücke, past the Suworow monument along old mule tracks to Göschenen. You can admire the impressive high rock faces of the Schöllenenschlucht gorge with the spraying Reuss. You hike over avalanche galleries to the stone Häderlis bridge and on to Göschenen. The hike can be extended with a circular path near the Devil's Bridge. If you want to catch a glimpse of the Schöllenen gorge, you should take the Schöllenen circuit under your feet. It is easy to walk on, takes a maximum of 30 minutes at a leisurely pace and offers a fascinating view of the vertical rock faces and the rushing Reuss. Please note that during the winter months the path in the Schöllenen is not accessible.